Does your dog always pull at the leash? Are all training methods failing you? If so, then it’s time to get a little strict with your canine friend. A prong collar is a perfect way to train your stubborn friend without ensuring any pain or injury. Unlike a choke collar, it simply pinches the skin on the neck, simulating the effect of another canine nipping at the neck. But, how does it help your dog exactly? It is important to fully understand the risks associated with any new device. Our article will help you obtain all the details you need about prong collars and how to use them best. What Is a Prong Collar? A prong collar, more commonly known as the pinch collar, is a special type of collar constructed out of a metal chain. You can add to the length of the collar by adding more chain links or even shorten it by removing some. The unique part about these collars is that each metal chain link includes metal prongs that stick to the dog’s skin. Most dog owners do not consider themselves a fan of the prong collars as they consider it an inhumane way to train your dog. However, if you use it correctly, it can be the perfect tool to help your dog behave in public. While that may be the case, it still can hurt your dog if you do not know how to use the collar, especially on smaller dogs. How Does This Type of Collar Work? As we already mentioned, the prong collar consists of various metal chain links or loops that fit into each other. Each chain has a prong that acts as the training aid. Also included on a prong collar is a silver ring at the front through which you can attach a leash. Usually, this ring sits at the back of your dog’s neck. When you walk your dog with the leash on, the prongs simply rest against their skin. However, if your pet starts to pull or tug at the leash, the collar tightens a little and the prongs on the back side of the collar start pinching the dog’s neck. This tends to create an unpleasant sensation and helps deter any pulling by the dog. We highly recommend that you use the collar and leash only when walking your dog by your side and not in front of you. The reason being that some dogs tend to pull lightly when they are walking in front, even if they are trained well. For those who are unsure about finding the perfect dog prong collars, we have compiled our best three. Herm Sprenger is one of the most popular brands when it comes to training collars. Their Ultra-Plus Prong collar has taken the world by storm. The collar is a safe and effective training tool for your dog. It can easily fit dogs that have a neck of around 14 inches. Also, the collar is quite durable as it features a steel chrome plating. This ensures that the collar lasts throughout your training period. The best part is that the collar comes with a center plate. This allows you to correct the pressure distribution so the prongs don’t puncture the dog’s skin. Moreover, the collar is available in a number of different sizes including fine and extra heavy size. All in all, the high-quality German craftsmanship of the Herm Sprenger makes it our top choice. Another one from Herm Sprenger, this collar is quite similar to the first one. The only difference is that it includes quick release snaps. As a result, it is much easier to size and fit the collar as you can easily open the links and close them. This collar also includes a high-quality chrome coating over steel construction. Consequently, you get a collar that is highly durable and will last your years. It comes highly recommended by trainers that have tested it out themselves. Furthermore, it measures about 21 inches in length which makes it perfect for accurate sizing on dogs with larger necks. The Pettom Dog Prong Collar is yet another amazing training collar that is available at a very affordable price. It features adjustable chains that are total 22 inches in length. This allows you to add or remove links to adjust to your dog’s size. Also, the surface and construction of the collar are corrosion-resistant. This ensures that the collar will be unaffected by nature and its elements. Furthermore, the collar features a nylon loop which is much more comfortable than the metallic chain design. The quick release buckles make it easier for you to put the collar on or off. The 2 D-rings allow you to attach the leash conveniently. There are various benefits and drawbacks of using a prong collar. Before you begin using these for your dog, it is important to know how they can affect him, in a good or bad way. It might be easy to simply write off prong collars as a gimmick that may or may not harm your dog. However, most experts and vets agree that they are a great training tool. The device itself is not designed in a specific way to hurt dogs. Any damage is due to the improper use of the prong collar. When used properly, they simply exert a little pressure on the neck without damaging any organs. The pressure is quite like the pressure a mother puts on her pups’ necks when she carries them around. One of the major reasons most owners do not take their dogs on walks is that they continue to tug or pull on the leash. This behavior can often lead to a variety of accidents and traumatic incidents such as your dog running off into traffic or falling into a ditch. On the other hand, if you do not walk your dog often, he can become cranky and jumpy which encourages bad behavior indoors. You might find him chewing on furniture, jumping, and barking. It can also affect their mental health and happiness. With prong collars, you can easily train your dog, making it safer to take him out to the park or the streets. Unlike shock collars or martingale collars that can be quite hard to use, these are quite simple. As soon as you have a perfect fit, you wouldn’t face any troubles in using it. Simply, put it on and you’re good to go. Make sure that your pet is calm to begin with, especially in stressful situations, gradually increasing its activities with the collar on. 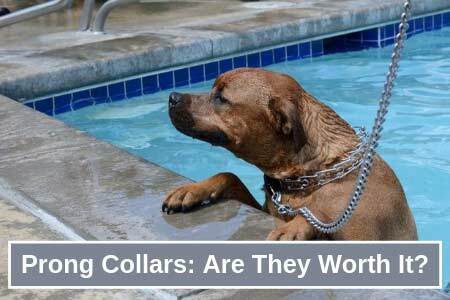 Prong collars have earned their bad reputation due to the misuse and misunderstanding most pet owners put them through. They easily snap or tug on the dog even when he is behaving well. It is not supposed to be for disciplinary action. A quick jab to communicate is quite sufficient. Positive training can give you positive results. So, why would you make your dog go through any form of pain when there are more humane methods available? While it may be quite humane, it still isn’t as much as the other options. If used incorrectly, they can lead to neck injuries and damage to the trachea. Studies show that most neck injuries are related to tugging and pulling from any type of collar. Some experts believe that a training collar, such as the prong collar, causes discomfort to the dog, which, in turn, makes them even more reactive. A pinch collar operates by fitting very close to the dog’s neck. When fitting, you need to ensure that the prong collar isn’t too tight. This is why we recommend that you do not use these collars with dogs that have more fragile necks such as toy dog breeds. These collars may apply a great deal of force on the dog’s neck which can be unhealthy and can result in various complications. However, there is a micro prong collar on the market that specifically caters to these smaller dogs. It is safe and humane for these little balls of fur. While prong collars may be a great training tool and,debatably, humane, theyare often incomplete. This is because when the dog pulls or tugs on the leash, the collar immediately locks onto their neck. However, it might not make the dog realize what’s wrong. It might take a long time before your dog associates the feeling of discomfort with pulling the leash. Even if your dog realizes it, the collar only tells him that he is wrong. It does not correct him or reward him for correct behavior. Without correction and constant feedback, it creates a communication gap. Thus, it makes the tool almost useless. When choosing a prong collar for your dog, it is essential that you speak to an expert or a dog training professional. Unlike other collars, a prong collar is a piece of serious equipment. You should consult with a professional about how to properly use one and how to choose the best one for your dog. They can help guide you towards the ones that are most effective and the least painful. 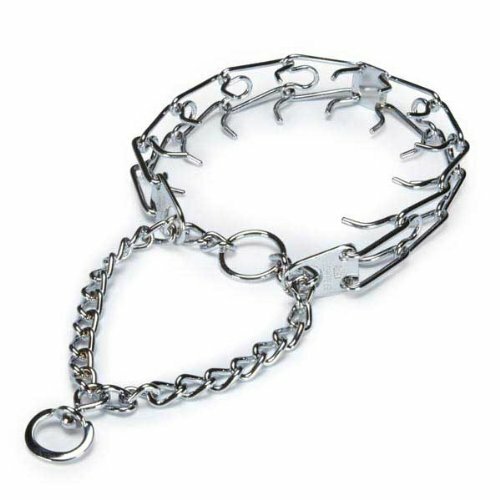 Also, remember that the prong collar is only for long walks out on the streets. These training walks should be at a specific time. Other than that, you should use a regular leash and collar for walks that occur outside of training time. It is a long-term process that might take quite some time. Purchasing the correct collar can often lessen the amount of pain your dog feels. High-quality collars only gently pinch the skin and simulate the effect of a gentle bite hold. Low-quality collars can actually puncture the skin or result in a choke hold that can damage your dog’s neck. Another aspect you need to care for is choosing the correct size. Most collars are available in a number of different sizes based on the size and weight of your dog. So, it is necessary that you choose the correct size for your dog. For instance, if you choose a collar that is too big for your dog, then your pet might not be able to handle it. It would add the discomfort of extra weight on their shoulders. Furthermore, if you buy a collar that is too small for your dog, it might end up pinching him even when he is not pulling or tugging. This absolutely defeats the purpose of the collar. A great tip is to buy prong collars from certified trainers. Most chain stores hold very low-quality collars that can often puncture your dog’s skin. Also, never buy rubber ripped prongs. You might think that they would be gentle on the skin as they are softer. However, rubber can easily tangle your dog’s hair and cause him pain. Metal prongs move much smoother and result in lesser pain. To ensure the perfect fit for your prong collar, it is important that you remove enough links to ensure that the collar fits snugly. Otherwise, it may hang down and hurt him. It should sit behind his ears and under his jawline. His neck may be too long and it is not recommended that you put the collar anywhere on the neck. A common mistake that most pet owners make is slipping the collar over the dog’s head and moving it to the neck. However, that is not the correct way. You need to put them on and off by unhooking or unlinking the chain links. Simply, pinch the hooks and pull them away from each other. Next, you should wrap the collar around the dog’s neck in the appropriate position. The point where the two links join should be the reconnecting point. Simply reconnect the two links. It is important that you use your thumbs to put pressure on the links to reconnect them. Once you have sized your dog, you should put the collar in the appropriate position. It is important that the ring for the leash is on the right side of the dog’s head. If the collar is too loose, then try removing one more prong. Use the collar only for an hour at a time. It is not intended for long term use. Use the collar only during training sessions and not for every walk. Otherwise, you can end up irritating his skin. Do not tug too much on the leash. Instead, use short but firm tugs to let your dog know he needs to stop pulling. Constantly pulling on the neck can be harmful and stressful for your dog. Prong collars are meant to mimic the gentle nip on the neck from another dog member. Constant pulling can defeat that purpose. Do not use these on a puppy. They are intended for larger dogs and only to be used with the most stubborn lot. Most experts deem them not to be safe. Take the collar off after you are done with your training. Prongs can easily get stuck on an object which can result in choking or other injuries. Use a harness if you need to reduce pulling and tugging during regular walks. If your dog has no need for it any longer, then cease use immediately. They are not really good for long term use. All in all, prong collars can be the perfect training devices for the largest and most stubborn dogs. They can be quite humane, provided that you use them properly and after proper fitting. Otherwise, you can end up with a dog that is injured, stressed out, or in pain. 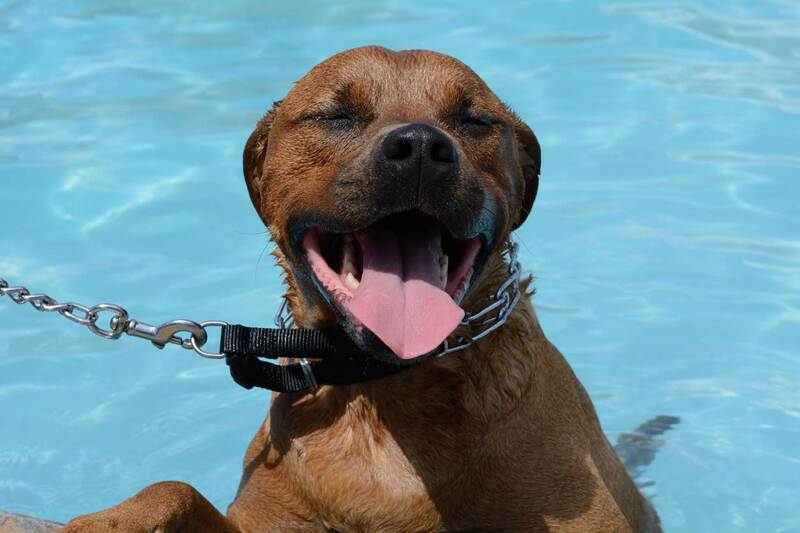 If used properly, you’ll find that your dog has learned quickly and easily without any stress. Choosing the best prong collar is entirely up to you. However, we strongly recommend that you speak to a professional dog trainer before makingyour choice. Ask them for their opinion and also if your dog really needs the collar. Most of the time, behavioral problems can be solved in an easier way. 1 What Is a Prong Collar? 1.1 How Does This Type of Collar Work?